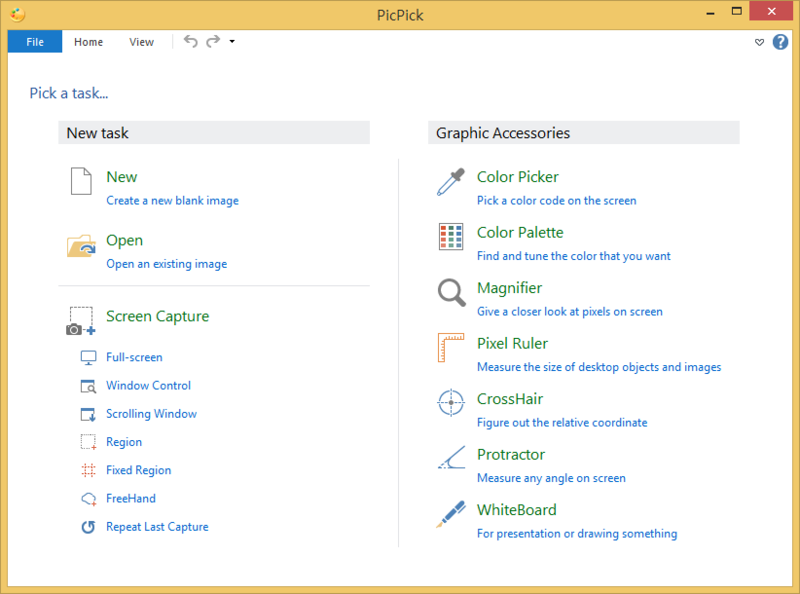 PicPick is an all-in-one software for software developers, graphic designers and home user. It has an intuitive interface and simple, elegant operation. 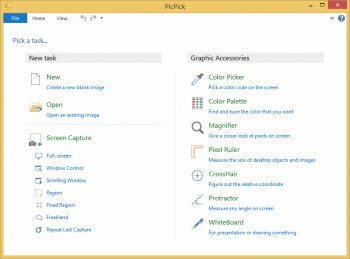 After starting the software, you simply select one of the tool from the PicPick Tools trayicon menu when you want. It features a powerful capture tool, image editor, color picker, color palette, pixel ruler, protractor, crosshair, whiteboard and etc. You can use all these tools freely. Best program of it's type that I found, but that highlighter bug makes me keep my eye open for alternative. Nice features and free. Works well. Not bad at first look. But needs a lot of work to use it most effectively. PicPick is classy software, it's attractive to look at and fun to use. Its designer has an excellent graphic design sense and he's laid out the software in a neat and logical way and he's paid much attention to the program's ergonomics. The program has many features with screen capture and subsequent editing being strong. I found PicPick particularly useful as a quick aide memoire when reviewing software. I could print-screen a running app and scribble or type notes about it in big red letters then save the image to a file. I agree with anomaly's comment about PicPick's thirsty juice requirements. I found it used 30-something MB standing still which easily nudged up to about 47MB with little coaxing. PicPick also clashes with PrintKey's function key allocation (and I'd imagine it also does so with other print-screen utilities), nevertheless it detects the clash, names the utility it's clashing with and provides the user with an intuitive way of reassigning the function keys. My solution is to load it when needed. Despite foibles, I highly recommend PicPick. Nice but it uses 40mb standing still. I decided to run it only when I actually use it and then kill it after. Great piece of freeware! Come up good. Show capture bar is a cool add on to this version though it cannot be stuck to horizontal edges. It would be nice if can be. At the moment, the bar is just vertical. Excellent freeware for personal use. Maturing well with features added at regular intervals. Apparently, Bobad is talking about an entirely different program. That, or he hasn't actually tried PicPick (or bothered to change the default settings). Cons: Very annoying bug with the marker pen function - every stroke of the pen dims the entire image by 1 level, it just gets darker & darker until the entire image is solid black. Bottom Line: Best program of it's type that I found, but that highlighter bug makes me keep my eye open for alternative. If you set output to anything other than the editor it does not pop up at all. As far as the ask toolbar bs, that's what uni extract is for. I don't even notice that part at all. And as for little packages, there are a ton of free stuff that use that ploy, not just simple softwares either. You can capture a picture and automatically save it to a folder, but only 1 at a time now. That's because the editor pops up after each capture, and you have to dismiss it before you can capture another picture. The little "package" you get with PicPick is annoying too. It tries to change the homepage for your web browser, change the default search engine for web browser, and to install ASK toolbar. None of these are necessary for the program to install or function, so do de-select them. bobad hasn't looked at the program options. It is possible to auto-save to a folder. There are a few steps to it which are a little confusing (set auto save location and set output type to auto-save - not to Save As Image File). All of the other options seem simpler. I wish the Editor's Save button was on the toolbar/ribbon, saving a click into the menus. PicPick used to be a fine screen capture program, but the latest 4 or 5 releases have been unusable. I like to snap a quick series of captures and have them saved automatically to a chosen folder. Version 2.0.3 was the last version that was possible. Now, when you snap a capture, that editor critter pops up in your face, making that impossible. I just don't get why developers ruin their programs. The good news is, 2.0.3 is still out there, and it's portable. I give it 2 stars, 2.0.3 rates 5 stars. Best freeware out there. Kind of screencapture clone. As mentioned below 2.3.1 is the latest.